I am working on an afghan that I found online. There is a picture of what I am actually trying to do below. When I followed this image, it led me to the Red Heart Radiating Ripple throw. This is not the same pattern as the pictures afghan. 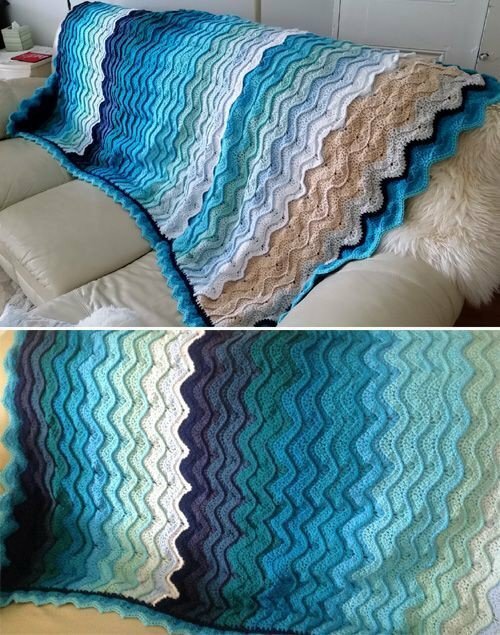 I looked around on Red Heart and found the Ocean Waves afghan, which is the pattern I am using. However, I want the double crochets to stand out and "pop" more like they do in the "beach" afghan picture. I am not sure how to create this. Does anyone know how to do this? I have tried flo and blo and neither create the desired effect. Hi, welcome to the 'ville! I didn't blow up the photo to count rows, but I'll guess it's every 4 rows, work into the Back Loop Only of the stitch. The ridge will only show up on 1 side, so the repeat (which the last row is BLO) would have to be an even number, to keep the ridge on the same ('right') side.